Aviation Safety Regulatory Review (ASRR) author David Forsyth estimates it will take about two years to fix the relationship between the industry and the regulator. However, trust between Australia’s aviation players and the Civil Aviation Safety Authority (CASA) would take longer, Forsyth says. In an indication of the lack of trust in Australia compared with other countries, Forsyth noted carriers such as British Airways and Easyjet freely sent the majority of their operational safety data through to their national regulator, something that would be unheard of here. “I would never have done it in Qantas 10-12 years ago and you can be damn sure no one is going to do it in this country now,” Forsyth told delegates at the Regional Aviation Association of Australia (RAAA) national convention in the NSW Hunter Valley on Friday. Forsyth said the industry’s view that the relationship with CASA was both inappropriate and unhealthy centred on the availability and use of safety data. Technological advancements in aircraft design and production meant safety systems had evolved, making operations more reliable and eliminating the likes of fixed interval overhauls and “over-the-shoulder” inspection and quality assurance roles. As a result, regulators needed to know more than what was available from incident reports, such as information from airlines’ increasingly sophisticated data and analytical tools within their safety management systems. However, Australian carriers were increasingly reluctant to share any more than was legally required to CASA. “There was even some evidence that some people were actually not even reporting the mandatory data to CASA,” Forsyth said. While airlines in some countries sent their safety data directly to the regulator, Forsyth noted Australian operators sent their information to the Australian Transport Safety Bureau (ATSB), where it was “de-identified” before a summary was produced for CASA. He described that process as “clearly out of step with best practice”. The ASRR report highlighted the at-times “adversarial” relationship between the industry and CASA, and that a new director of aviation safety (DAS) would be a chance for structural and cultural change. “Their view was that you could certainly within two years if you approached it the right way get the relationship with the industry fixed,” Forsyth said. Reviews into Australian aviation were nothing new, Forsyth said, with the ASRR the 10th government-initiated probe into the sector since the Plane Safe inquiry of 1995. Moreover, there had been seven reviews in the past seven years, including two conducted by a Senate Committee. 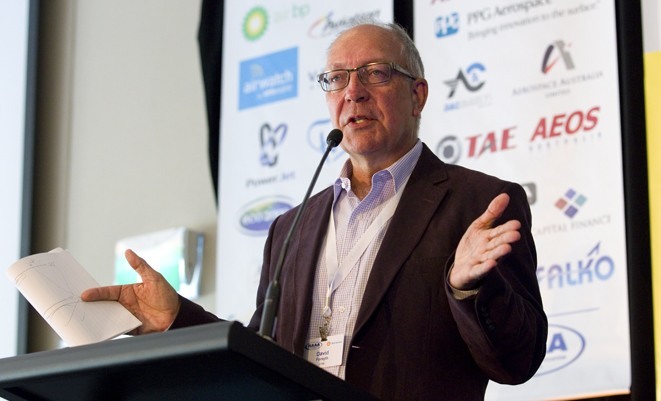 “Even in Australian aeropolitics that is not normal,” Forsyth said. The federal government has pledged to respond to the report’s 37 recommendations before the end of 2014. I worked with David Forsyth at Qantas for many years and we became friends. He has always been a ‘straight shooter’, telling it as it really is. He would do well as the head of CASA, if he would be considered.